I’ll confess: baking with squashes other than spaghetti squash intimidate me. I don’t know why; maybe there’s this subconscious worry that anything I make using it will make it taste, well…squashy. Kind of like the butternut squash soup I made awhile back. Ick. I have some squashes leftover from my CSA that are juuuuust at the end of their shelf life, and need to be cooked up quickly, before they start to go to waste. 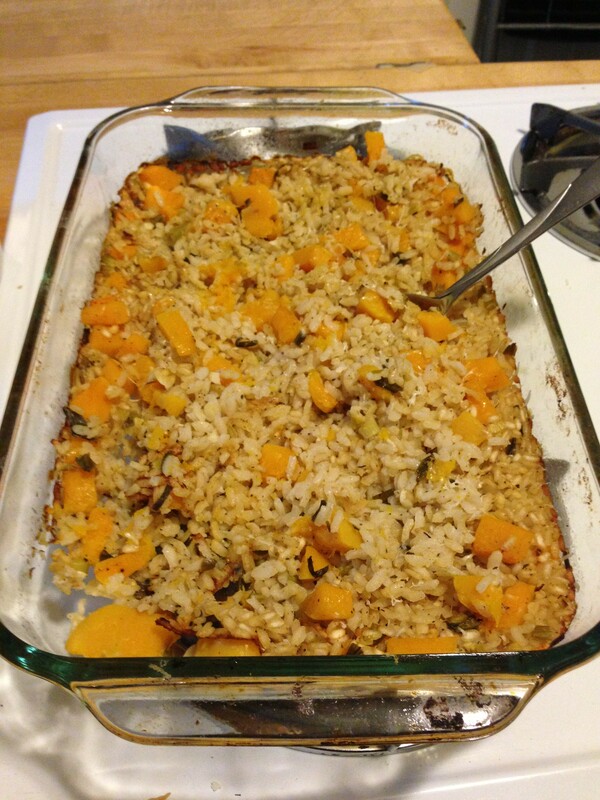 This was one recipe that I found that utilized a butternut squash that I had, and I really enjoyed the end rest. It’s great for a chilly, snowy evening. The rice that the recipe calls for is actually the risotto (Arborio) rice that many of you know and love. However, any type of short-grain rice will work, too. Preheat the oven to 350*. Place the squash (whole) on a baking sheet and bake for 30 minutes until tender. Let cool. Meanwhile turn the oven up to 400*. Peel the squash, & cut in half lengthwise. Scoop out the goop, and cut into 1/2 inch pieces. In a medium saucepan, bring the broth, water, and sage to a simmer (do not let it boil). Heat oil in a large nonstick skillet over medium-high heat. To the skillet, add the onion; sauté for about 5 minutes. Add garlic; sauté for about two minutes (be careful not to let it brown too much. Add rice& toast for about 1 minute. Stir in the squash, broth mixture, wine, chopped thyme, salt, and pepper. Cook 5 minutes, stirring occasionally. Coat a 9 x 13 baking dish with cooking spray. Pour in the rice mixture. Bake for 30 minutes in the oven (already preheated at 400). Remove from oven & stir mixture gently. Sprinkle with cheese; bake an additional 5 minutes or until cheese melts. This would also be a great dish to bring to a fall/winter potluck or family dinner. I served this with baked chicken; the leftovers reheated very well also. One of the things that most impressed me with this recipe how you baked the squash before cutting it up. Before, I’d grab the sharpest knife in my house, say a prayer, and start hacking away at the gourd. Baking it will soften it up so that the knife will go through easily, and you’re less likely to cut off the tip of your thumb! 😉 If you ever are cooking with an entire squash again, try this technique! I’m very pleased with how this turned out, and am glad that I finally found a successful recipe for butternut squash. It’s no longer a stranger lurking in my pantry, and I’m very confident that I can make other delicious dishes with it now.